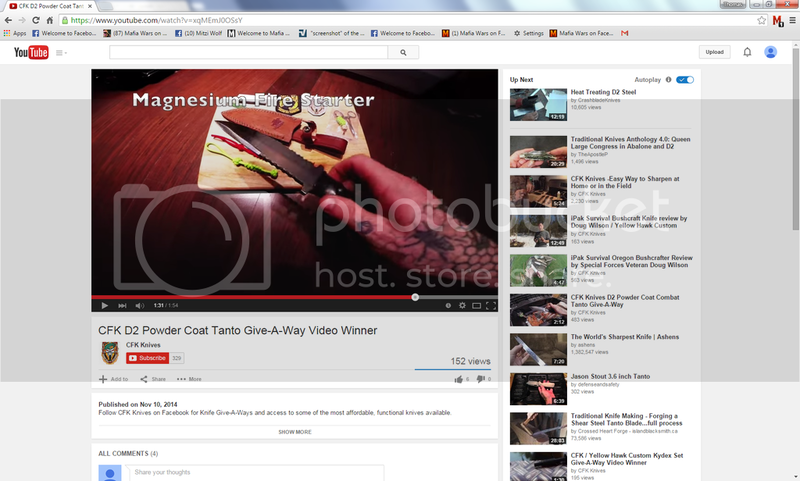 Discussion in 'Knife Reviews & Testing' started by Last_Ditch, Mar 4, 2015. I had purchased a CFK knife (1095HC) last week, and was patiently waiting for it's arrival. I did a search here to see if there was any info on the company. I was shocked to say the least. My heart sank after reading most of the info. The knife arrived yesterday. After spending a few minutes looking it over, I was a little confused. I spent $50 on this knife, but it looked fairly decent. I decided to contact the CFK guy from the "auction" site. I asked him very specifically if this was a premade stamped out blade he put a handle on and called it custom. I even tried to get fancy and posted the legal dictionary link to Misrepresentation, and False Pretenses. I expected a few days to pass before a reply, but to my surprise I spent a little over an hour with him on the phone, 10 minutes after my email was sent out tonight. He stated when the company was started a year and a few months ago, they tried to get into the typical outdoor stores and various publications. They had a hard time getting space due to the saturation of well known knife brands already out there. They made a few Tom Brown tracker clones, and copied a few other notable designs to sell on the "auction" site. This, he said, was their biggest downfall. 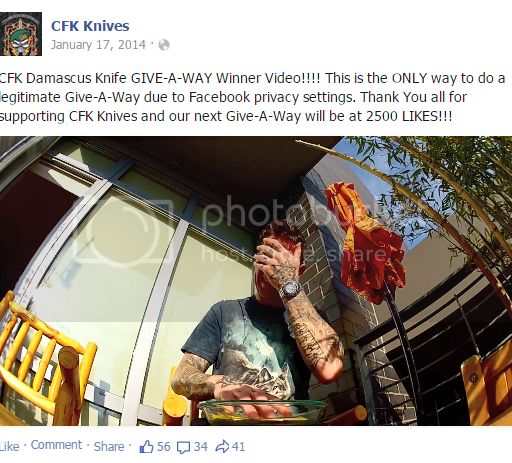 CFK was contacted by those knife makers, threatening with copyright laws. Tom Brown is a TM not just a design they were using. This hurt the name CFK obviously. CFK stopped making that specific design and stopped using the Tom Brown name (they still make a variant of the design, legally). He said they clearly made some mistakes early on trying to become a household name in the cutting business, but was making every attempt at making things better from then on. Since, they have been making knives to sell at wholesale prices on the interwebs. Their idea was to get their knives in the hands of actual users to show the quality of what they were making at an affordable price for the common working man. Thus, putting their money where their mouth is. They have 2 knife "lines" in production. 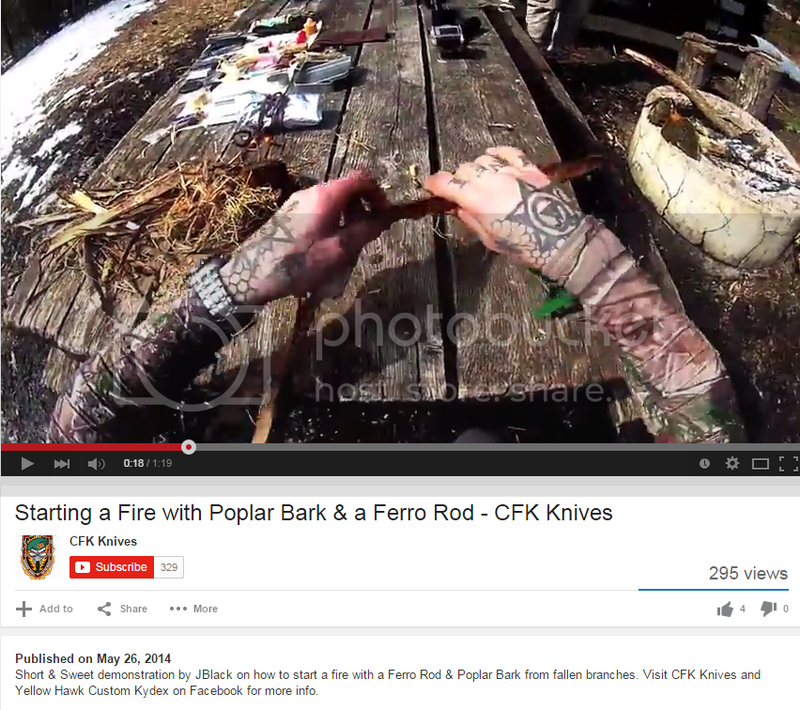 The CFK label (the traditional knife company starting line) and the newer IPak Line. The Ipak line was created by a guy named Jason (He is the guy you see with all the tattoo's) He is a 15 year Army SF vet. The IPak is the less refined, "budget" line. During our chat, he offered all the information I could take in. Everything from the guys names in Essex, England that grind the blades, their phone numbers and contact information, to the guys in Oregon who put handles on the knives and do the finish work. He gave me general information on numbers of sales, where the leather comes from, and buying bulk steels. He talked about where the company started, where it was heading, the direction he wants to take it, and everything in between. The guy I spoke with seemed genuine and honest. I am pleased with the knife I received from them. I work with Army Aviation quite closely, and actually took the knife to the Sheet metal shop to use their equipment to run a test. The knife was listed as 1095HC treated to 58-60RC. It hit very close to it, 3 strikes. Close enough that I can't dispute it. I didn't capture the specific pressure used, but the blade did flex 1/2" before we removed the pressure on a flex test. No bend memory or disfigurement. I have yet to take it out to do any "real" use testing, but I have no fear it will hold up under intended use. This information is not intended to change any ones mind, or take it as gospel. I did not call the people who's information he offered to me, nor did I fly to Oregon and sit down with him and his legal team. This is simply me letting the masses know what information I got from him and my own personal experience with CFK. This was my first CFK purchase, and I will not run away if another good deal presents itself in the future. Others on this forum have quite a different view of CFK aka CFK USA, CFK Cutlery, CFK Knives. BTW Jason Black also has gone by the name of Jason G. Baker. This blade forum thread starting at post 379 and continuing for several pages discusses CFK and who they are. Also more discussions on CFK here and here and here. Ditch, Jason Black or Jason Baker, depending on what day it is, is a good con man. The knives are from Asia. A picture of one lying on the workbench in Pakistan was posted here. He gets tangled up because the stuff he put on the Net years ago does not go away to clear a path for his new stories. For example, he has posted many times that his company started in 2005. He shows up on websites to review his own products and, guess what?, he gives himself good reviews: "best." "I broker deals with custom knife makers, one in particular, who uses German steel and hand finishes the Knives here in the USA. I have been selling knives for eight years. I have sold over 100,000 knives on the Internet & in shows, since that time. I'm an excellent negotiator & I have the best quality product on the planet." His "factory" which he claims has made over 20,000 knives is a small house on a quiet residential street in Beaverton. Do a Google Earth for 18815 SW Alderwood Beaverton. In addition to various iterations of "CFK" [Custom Forged Knives], he also does business as Fishcreek Cutlery and IPak. He claims blades forged of steels that are not forged or forgeable. He lists in local Yellow Pages databases as if he is local to all those cities. Once he slipped and listed one of his Fishcreek USA knives as "Country of Manufacture: Taiwan, Province of China." So hard, poor dear, to keep all the balls in the air. Then there's, the Indian "Artist"and medicine man who supposedly makes Jason's Buck Yellowhorse rip-offs, Michial "Greywolf" Garvin. That's a whole story in itself. If you doubt the forum consensus, I would be happy to give chapter and verse. Jason Black is the trademark holder for iPak. Survival and Jason Baker is the trademark holder for CFK Cutlery Co. Neither are one in the same, they are different people. Selling knives on eBay is more difficult that any other medium as the customer can not see or touch the product and must be told what he is getting. Being expressive with the information is very important and is what has earned CFK their Top Seller status, 100% positive feedback, and 4.9 or better DSR scores. By being overly expressive with the imperfections (and showing up to 12 high resolution photos of each knife) of the handmade knife the buyer will be receiving, is what eBay is all about. CFK has 16,083 Positive Feedback received, 19 Neutral, 4 Negative. The CFK factory is located in England. The Damascus is made there. The D2 and 1095 are sourced in Europe and made into knives in England. The handles are assembled in the USA, as stated on every listing on eBay. Putting the letters USA on the brand mark does not state "made in the USA". There is an entire topic on this at the FTC website. CFK does not state the knives are 100% made in the USA. In Oregon there is no state sales tax, and if the DBA (Doing Business As) is done out of a home address, this is legal in Oregon. The CFK business address is listed on the YP.com as 2056 NW Aloclek Drive, not the 18815 SW Alderwood Drive. The YP.com is a paid advertisement, that shows up under certain search words. YP.com is responsible for how it shows on their website not CFK. The YP.com page is clear and states the company is in Oregon and when going to the webpage specifically states all items are sold on eBay. No where on YP.com does it claim that CFK is located in the US State where the YP.com paid advertisement is being displayed. On each YP.com page under "Sponsored Links" CFK Cutlery pops up as it is a Sponsored Link. The word "fishcreekcutlery" is the email address to the PayPal payment account and is an email name. When you are selling on eBay you can not have the same eBay user ID as the email to a PayPal account (up until recently you could have the same email as the eBay user ID, but with internet hacking, this was changed. Anyone with an email matching there profile, were grandfathered in as with the "fishcreekcutlery" email that used to match the eBay user ID. New accounts had to have different email accounts that did not match the user ID on eBay. "fishcreekcutery" is not another business name for cfk-cutlery-company. Prior to changing the eBay user ID to cfk-cutlery-company it was named fishcreekcutlery. On the fishcreekcutlery eBay ID they used to sell United Cutlery seconds and other knives which were all made in China and Taiwan, so the listing would have been correct stating: "Country of Manufacture: Taiwan, Province of China. Later, the user ID was changed to cfk-cutlery-company and the new knife product was introduced, but the email address for the PayPal payments remained the same fishcreekcutlery... Now the items are listed in the UK and USA manufacturing locations with the new CFK / iPak. Survival knives which matches what they state on each eBay auction. Michial "Graywolf" Garvin did 5 folding knives for CFK on Consignment. 1 Sold on eBay. 4 more are listed for sale on eBay on random pattern Damascus knives that are not Buck copies. The CFK knives are sold for wholesale prices to the public on eBay, thus the average 50.00-130.00 range sale ranges. Most are sold at .99 cent auctions so the ending values are being set by the customers who feel the knife has the value set by the ending hammer value of the eBay auction. These values are not set by CFK, which is an indicator that the customer has confidence in their knives. By viewing the 16K positive feedback, the majority of the messages left are that the knives are made very well for the price paid, have very high quality buffalo hide leather sheaths, have a lifetime replacement guarantee, and fast shipping to the customer. Hello, Jason, Welcome to the forum. "Jason Black" has repeatedly posted as "president " of CFK (You can't edit what's in the Google cloud.) and uniformly appears on line as the spokesman for CFK. Other than appearing on the legal papers, the other Jason, Jason G. Baker, does not appear to exist for CFK/iPak/Fishcreek purposes. On public records, both Jason's are associated with the same two addresses. Here is Baker at the address listed for Black's business alias. 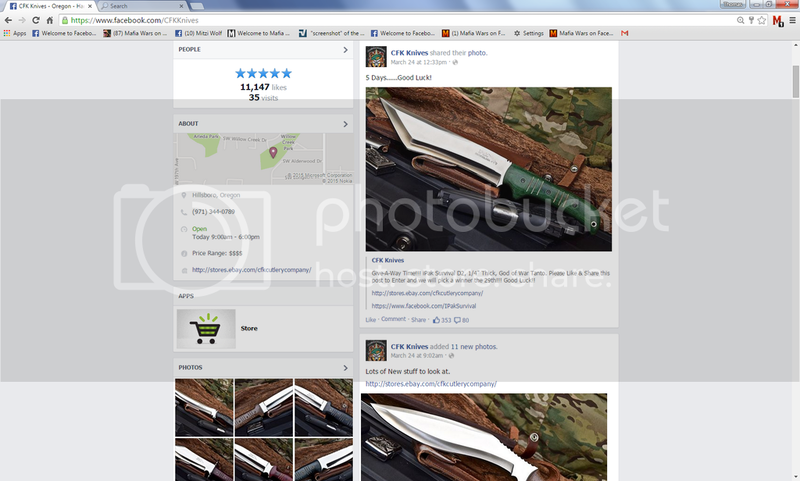 You regularly sell " CFK USA iPak Survival Custom Handmade" knives. Seems like two sides of the same card. Indeed. Very true. As a result the buyer has to rely on the accuracy of what CFK posts. FK does not state the knives are 100% made in the USA. That is what you say now. Clearly not "Custom" and, to the extent made of D2, probably not "Forged." However, you have said different things at different times. CFK was started in 2005 as a private label custom knife shop in Beaverton, Oregon, USA. We make each knife by hand using old school techniques. We have Damascus bars made to our specifications and then we import them here to the USA and make our knives in a small brick & mortar knife shop. I have been selling knives for eight years. I have sold over 100,000 knives on the Internet & in shows, since that time. I broker deals with custom knife makers, one in particular, who uses German steel and hand finishes the Knives here in the USA. The steel is forged in England and expertly treated in the USA. The steel is forged and treated in England with American craftsmen assembling the final knife to insure extremely short run knives, each hand made. The handle materials, blade steels, leather sheaths are all made professionally in the US. This full tang knife was designed by me and custom made by an outstanding and long time- Knife Makers Guild in England. Some of the finest bush crafting knives I know of, come out of this Guild and, out of England for that matter. They execute my designs perfectly. I have a knife contact in Pakistan who sent me a photo of a CFK knife sitting on a table in a leather sheath makers shop. That's not to say they don't just ship sample knives to Pakistan and have their sheaths produced there but it is curious. So, Jason, what can we be sure we know about how these knives came to be? We need that level of confidence to pull the trigger. I think we can agree that they are made of something, somewhere, by someone. By the way, knife guilds never made knives. Their individual members did. And the folks in the knife forum over there in the UK know what's going on. Shall we check? Pity. Your knives might even be a good deal. Jason Black has the tattoos on his arms. He is the spokesman for the Facebook page and the field tests. "On public records, both Jason's are associated with the same two addresses. Here is Baker at the address listed for Black's business alias." - Correction: This is Jason Black doing a blind raffle by covering his face to not look at the names in the give-away bowl for a Facebook Giveaway drawing. Jason Baker is the owner of the business. What feed is this line from? "This full tang knife was designed by me and custom made by an outstanding and long time- Knife Makers Guild in England. Some of the finest bush crafting knives I know of, come out of this Guild and, out of England for that matter. They execute my designs perfectly." Correction - When selling on the internet the entire description line are key words. Putting CFK and iPAK in the same sentence is for KEY WORD searches. "Your knives might even be a good deal." - I do appreciate this, Thanks. I know if you get one of the new CFK D2 knives in bone or micarta, you will be very pleased with the product. Yes. As I said, he's the only Jason who appears for CFK/iPak. Lovely tats. An eBay sale by your spokesman "Douglas Wilson- veteran 18E A-Team Operator, U.S. Army Special Forces." Although, in fairness, the knife he was selling is not marked as a CFK or iPak knife. Perhaps he too speaks of himself in the second person. No correction. You do not distinguish. The two names are mixed and matched in advertising. They use the same two addresses. The same person uniformly appears and speaks for both. Your eBay text uses both names routinely. "This full tang knife was designed by me and custom made by an outstanding and long time- Knife Makers Guild in England. Some of the finest bush crafting knives I know of, come out of this Guild and, out of England for that matter. They execute my designs perfectly. Although, in fairness, the knife he was selling is not marked as a CFK or iPak knife. Perhaps he too speaks of himself in the second person." "You do not distinguish. The two names are mixed and matched in advertising. They use the same two addresses. The same person uniformly appears and speaks for both. Your eBay text uses both names routinely." Jason Baker owns the knife company and is not seen in the marketing. Jason Black does our video and Facebook marketing and is seen in the videos. You can reach him by sending a message to him on Facebook if you would like. We are an internet based knife company and all our marketing and sales are done via internet and computer based business platforms and how we organize ourselves and do business works for us and our customers. I would encourage you to try one of our knives, test it, and see for yourself. Exactly. CFK and iPak. "the knife company" "an internet based knife company" The two names seem interchangeable. Both appear on the same page offering a single knife, sometimes labeled one way and some times the other. Nothing nefarious about that. I, for one, do not exclude the possibility of proper knives being made in Asia, any more than I do the other places you have indicated over a couple of years - the USA and England - or all of them, for that matter. Claims that are not true bring other matters into question. Of course you would. It's called capitalism. That's fine. Where are they made and how do we know it's true this time? Who are you DrBulldog? One of the Jasons? You call them "our knives" but your BF profile does not indicate your association with CFK. I would like to know DrBulldog's association with CFK/IPAK knives also. He's the spokesman for CFK/iPak, and usually that is "Jason Black." Your inability or refusal to use first person pronouns is unusual. You may need to join a different membership class if you are a knife manufacturer's spokesman.